Overall, I loved using the journal. 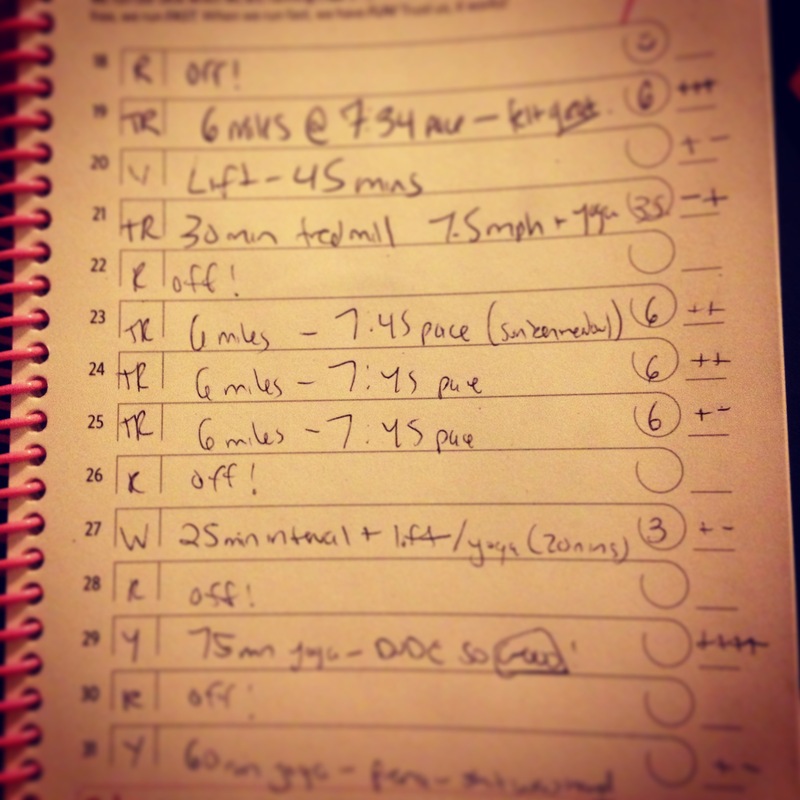 I’ve never actually tracked anything in my life before — food, workouts, etc — and it was both rewarding and helpful to look back at my training, especially when I needed a little mental push or wanted to figure out why I was so freakin exhausted. I definitely plan on continuing to use it, especially since come Monday, marathon training starts (and my life disappears…). Sooo, here were those goals I set back in October…and where I am now. Yes, but not in the way I had originally planned. At first, I wanted my sprint-speed back. My sub-30 second-200m-repeats no-problem-speed. But after really thinking about it, I realized my goals were stretched too thin. I could either get fast on the track, or get ready to run a strong marathon. I decided I wanted to build endurance — faster, yes — but that meant focusing more on speeding up on the roads, not the repeats. So with that, I think I’ve succeeded. After not running for nearly a month, I came back to December maintaining sub 8’s on the roads, which has felt nice and comfortable. Good things on the horizon for marathon training, I hope! More or less. I was challenged in a few different ways this fall: dealing with injury while trying to get faster at the same time. It’s pretty impossible to balance the two; I knew I needed rest, but I was also restless. I wanted to see what boundaries I could push, but was simultaneously scared of hurting myself, burning out too quickly, of just feeling the freakin pain. But I think — and journaling helped me a lot when my stupid head wouldn’t shut up — that I was able to get better at knowing when to take it easy and when to dive into mile repeats. All of my love to Lauren, Ro, Morgan, and all the #sistersinsport who have made this happen/have been along for the ride. Tis only the beginning of a beautiful thing!